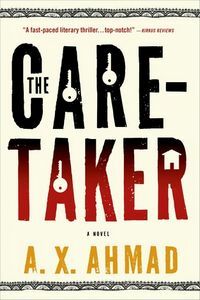 The Caretaker by A. X. Ahmad, a Mysterious Review. Review: Reluctant to return to working in his uncle's Boston store, groundskeeper Ranjit Singh wants to spend the winter on Martha's Vineyard, where he has settled — if only temporarily — with his wife and daughter. Just as he's down to his last dollar, he gets an opportunity to be the caretaker of a U.S. Senator's vacation home, earning enough to keep his family fed and warm during the long, cold season in The Caretaker, a novel of suspense by A. X. Ahmad. Ranjit's wife, however, is not thrilled with the idea, and would rather return to Boston. Still, Ranjit perseveres, and persuades her to remain on the island mostly because their daughter, Shanti, wants to stay in school with her friends. All that changes when the oil heater in their rental house breaks down and Ranjit is unable to pay to fix it. He quickly makes a decision to move the family into the Senator's vacant home while he saves enough for repairs. Several weeks later the home is broken into in the middle of the night by two well-dressed men, who bypass works of art and jewelry, clearly looking for a specific item … an old doll that Shanti has adopted, a doll she escapes with as the family flees. They manage to get to Boston together, but become separated, Ranjit with the doll and being pursued by the two men, his wife and daughter caught up by the authorities with orders to deport them back to India. The Caretaker develops more along the lines of a psychological thriller than action thriller. Indeed, it may also be considered a character study of a man in conflict with just about everyone and everything around him, including his own past. It is perfectly paced, with a solidly constructed backstory interwoven into the primary storyline centered on Ranjit's current dilemma. That Ranjit's past is linked to the Senator's present may seem rather unlikely, however the coincidence of it being is so carefully plotted that it does come across as natural. An underlying plot thread, one that helps keep a level of suspense simmering just below the surface, is whether or not the Senator is involved in all that is going on, from the break-in of his own home to Ranjit's family's pending deportation. And at the center of it all is a mysterious doll, one that holds the key to whether or not Ranjit has a future, and if he does, what that future may look like for him and his family. Acknowledgment: Minotaur Books provided a copy of The Caretaker for this review.